As you research the benefits of cabinet refacing, you may have noticed that some people use the terms “cabinet refacing” and “cabinet resurfacing” interchangeably. This can be deceiving because cabinet refacing and cabinet resurfacing are two completely different processes, and the benefits of refacing far outweigh those of cabinet resurfacing. In essence, cabinet resurfacing is like a bad facelift. Instead of looking like brand new cabinetry, cabinet resurfacing leaves behind the telltale signs that let everyone know your old, outdated cabinets are still there, but now have an inferior overcoat on them. 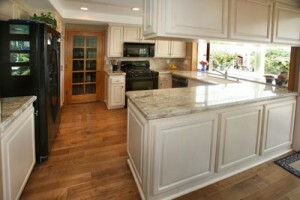 Now that you know more about cabinet resurfacing, you may wonder, exactly what is cabinet refacing and how does it work? First, your certified Vianvi Signature® Cabinet Refacing dealer will visit your home to help you choose the unique look you want for your cabinet refacing and to take precise measurements of all of your cabinets. These measurements will be used to create customized cabinet veneers, doors, and drawer fronts in our manufacturing facility. On the scheduled installation day, your countertops and appliances will be covered and the room will be sealed to minimize dust. Next, your old doors and drawer fronts will be removed, and a durable, beautiful, ¼”-thick veneer with the Signature edge will be bonded over your existing cabinet frames. Then, your new custom cabinet doors and drawer fronts will be installed. You won’t believe your eyes when you see the end result, and you’ll be wondering how such an affordable transformation could take place in such a short time. Vianvi Signature® Cabinet Refacing provides results that are night-and-day compared to those of cabinet resurfacing. We have spent years of hard work perfecting our process, all so that you can have flawless and affordable cabinetry in your kitchen, bathrooms, and any other area of your home. With Vianvi Signature® Cabinet Refacing, the perfect cabinet refacing experience is not only possible, it is guaranteed. For more information about the cabinet refacing services we offer and what makes our process better than cabinet resurfacing, or to receive a free quote for your contact your closest Vianvi Signature® Cabinet Refacing dealer today. Or, if you are interested in becoming a Vianvi Signature® Cabinet Refacing dealer, click here to learn more.